The first industrial application of a (semi)-automated machine was made in the early eighteenth century by a modest textile worker from Lyon, France. Basile Bouchon, working in one of the many silk centers in Lyon, invented in 1725 a way to control a loom with a perforated paper tape. Bouchon was the son of an organ maker and a weaver and was familiar with the rotating pegged cylinders used in automated organs, such as the barrel organ. Thus he knew the fact that the information content for the cylinders of musical automata was first laid-out on paper, before the design was applied to actual very expensive cylinders. The practice then was to punch holes in the paper designs that were wrapped around the cylinders, indicating where the craftsman had to drill holes in the cylinder for the pegs. 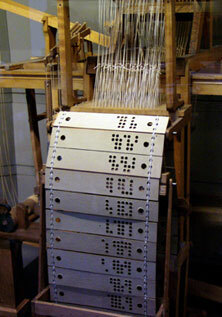 Bouchon probably had the brilliant insight that the paper layout with punched holes already contained the information put on the cylinder, thus he concluded that perforated paper could code information about patterns, which he subsequently applied to the coding of weaving patterns for the loom. 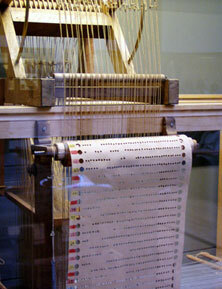 Thus Bouchon adapted the concept of music automata controlled by pegged cylinders to the repetitive task of weaving and partially automated the tedious setting up process of the draw loom in which an operator lifted the warp threads using cords, inventing an attachment for the looms, which used a broad strip of punched paper to select the warp threads that would be raised during weaving. Bouchon's invention involved a row of hooks. The curved portion of each hook snagged a string that could raise one of the warp threads, whereas the straight portion of each hook pressed against the punched paper, which was draped around a perforated cylinder. Whenever the hook pressed against the solid paper, pushing the cylinder forward would raise the corresponding warp thread, but when the hook met a hole in the paper, pushing the cylinder forward would allow the hook to slip inside the cylinder and the corresponding warp thread would not be raised. In spite of its advantages, Bouchon's invention did not have much success because the number of needles was not sufficient to allow the weaving of large designs. Besides that, he used a roll of paper (see the image nearby), which was not very practical. Only three years later, in 1728, one of the Bouchon's assistants, named Jean-Baptiste Falcon improved on the machine, expanding the number of cords that could be handled by arranging the holes in rows. He also replaced the paper roll with a set of punched cards attached to one another in an endless loop (see the nearby image), which made it possible to change the program rapidly. Each punch card controlled a single hook or needle. Falcon's system was superior because torn cards could easily be replaced whereas Bouchon's system required whole rolls to be reproduced if one tear made a roll unusable. Though the looms of Bouchon and Falcon eliminated mistakes in the lifting of threads, they still needed an extra operator (or even two of them) to operate. The loom of Bouchon and Falcon was modestly successful: about 40 such looms had been sold by 1762. The first attempt at full automation was made by Jacques Vaucanson in 1745, also not very successful. 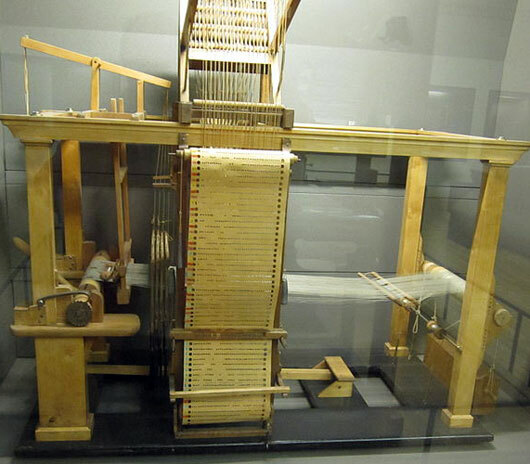 But it was not until 1805 that the widely successful Jacquard loom was finally produced.